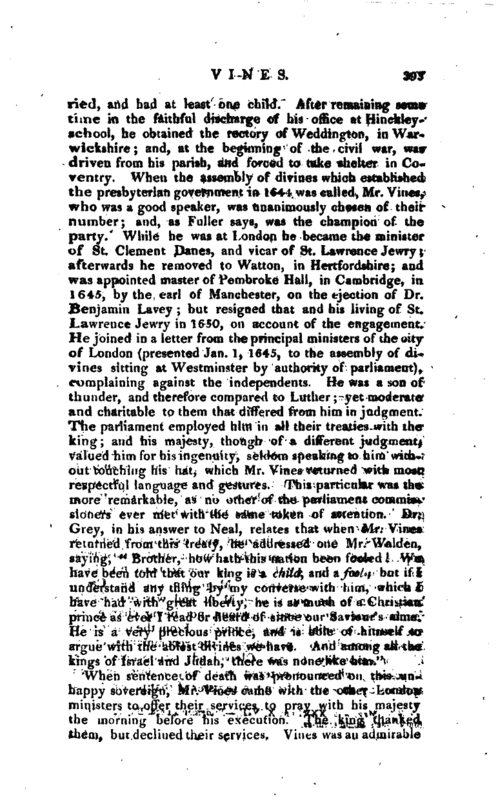 When sentence of death was pronounced on this unhappy sovereign, Mr. Vines came with the other London ministers to offer their services to pray with his majesty the morning before his execution. The king thanked them, but declined their services. 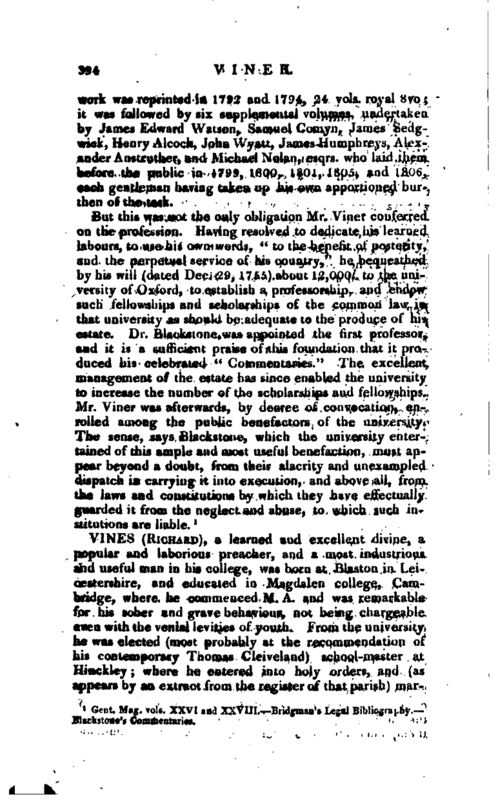 Vines was an admirable | scholar; holy and pious in his conversation, and indefatigable in his labours, which wasted his strength, and brought him into a consumption when he had lived but about fifty -six years. He was a very painful and laborious minister, and spent his time principally amongst his parishioners, in piously endeavouring “to make them all of one piece, though they were of different colours, and unite them in judgment who dissented in affection.” In 1654 he was joined in a commission to eject scandalous and ignorant ministers and schoolmasters in London. He died in 1655, and was buried Feb. 7, in the parish-church of St. Lawrence Jewry, which having been consumed in the general conflagration of 1666, no memorial of him is there to be traced. 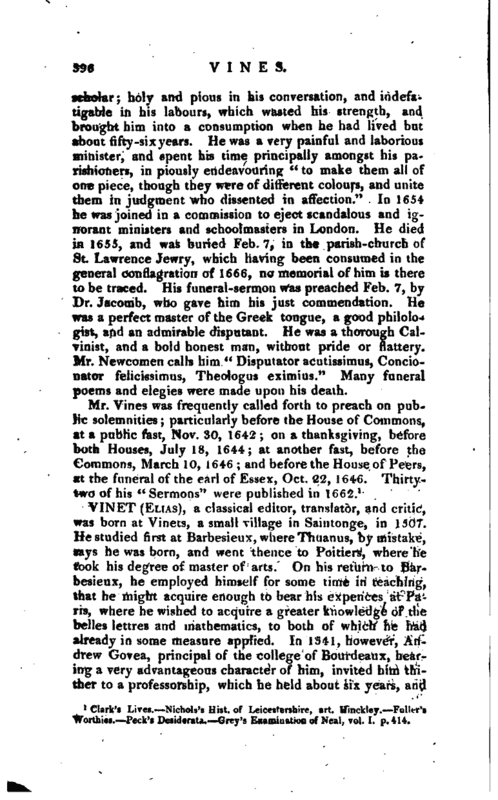 His funeral-sermon was preached Feb. 7, by Dr. Jacomb, who gave him his just commendation. He was a perfect master of the Greek tongue, a good philologist, and an admirable disputant. He was a thorough Calvinist, and a bold honest man, without pride or flattery. Mr. Newcomen calls him “Disputator acutissimus, Concionator felicissimus, Theologus eximius.” Many funeral poems and elegies were made upon his death. 1 Clark’s Lives. Nichols’s Hist, of Leicestershire, art. Hinckley. Fuller’s Worthies. Peck’s Desiderata. Grey’s Examination of Neal, vol. I. p. 414.